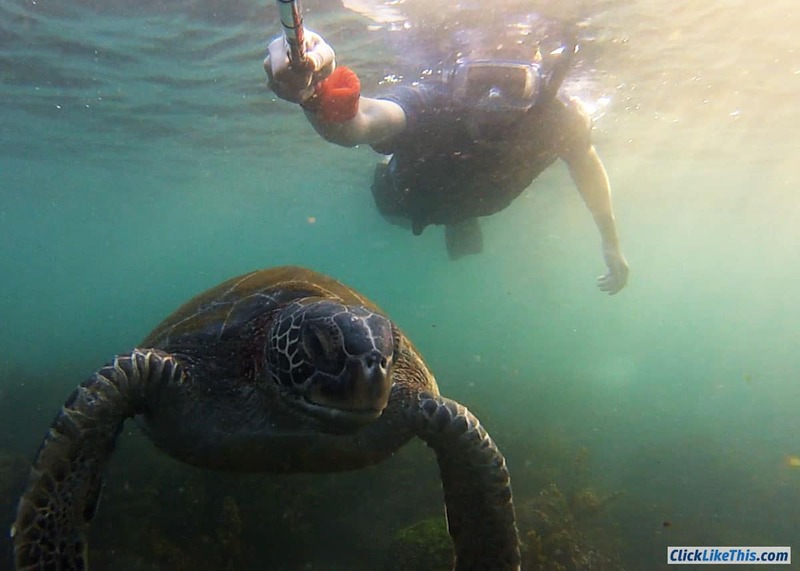 In this post, you'll learn how to use GoPro underwater. These underwater tips and accessories will help you take great underwater shots right away. Before you head out on your next adventure, take a few minutes to review these tips. How Deep Underwater Can a GoPro Go? Clean the gasket: Make sure that there is no dirt on the white rubber gasket. Dirt on the gasket will cause the case to leak. To ensure that you get a good seal, make sure that the backdoor is completely pushed into the housing, before clamping the black latch. Clean the lens: Take a minute before closing the case and make sure that there are no fingerprints or dust on your camera lens. And don't forget to check the housing lens as well (inside and out). Determine your underwater settings: I use two settings, depending on what I want to capture: Video and Timelapse. For point of video (POV), I suggest the 1080 SuperView at 80fps. For still photos, I use the time lapse. I recommend shooting at the highest resolution at either one image every 0.5 or 1 second. Here's more about GoPro settings. Use a lens filter to correct the color: Although it might not make sense at first, a red lens filter will make your underwater footage look better. You'll want a red filter in blue water and a magenta filter in green water. See some specific recommendations below. Shoot stable footage with a camera rig (or selfie stick): It can be hard to hold a GoPro steady. If you aren't going to mount the camera on your chest or head – you'll need a camera rig or selfie stick. I've had good success shooting animals underwater with a simple selfie stick. Keep your subject at least 12 inches away: Unless you're using a macro lens, you'll want to keep your subject a minimum of 12 inches from your lens. Any closer and it will be blurry. Shoot with the sun at your back: Without a flash, it's pretty hard to get a good shot shooting into the sun – regardless of where you're shooting. Thoroughly wash the housing in fresh water (especially after swimming in salt water): You should thoroughly wash the housing in fresh water. Salt can have a corrosive affect – and the last thing you'll want is to have a damaged / weakened case or gasket. Avoid fogged-up camera housing: Anti-fog inserts will absorb any humidity in the air. Without these special inserts, the humidity may condense on the inside surface of the case – especially on the lens. This causes a fog-ring and many disappointing images. Forget about WiFi: While you can use your GoPro WiFi underwater (with the correct WiFi extension cable) it isn't easy. And you'll be tethered to a mobile device on the surface. For most settings, you'll have more fun and get better footage by shooting with WiFi turned off. Use a dome port: A dome port is great for shooting those incredible half underwater GoPro photos. By moving the waterline away from the lens, you're able to get a photo showing both above and below the water. A dome port can also be used for shooting underwater. Prevent water drops on your lens: When you surface, you'll probably want to keep shooting. If you aren't careful, you're going to have weird, face-distorting water droplets on your lens – ruining all your footage. It's a surprisingly simple fix. And those are my tips on how to use GoPro underwater. Okay, now we're going to consider some great GoPro accessories that will improve your underwater photos and videos. 1. Underwater Lens Filters: These simple filters just pop on to the Hero5, Hero6, and Hero7 camera housing. These filters work from 10 to 80 feet in depth. Designed for color correction in blue and tropical waters. PolarPro also makes the same filters for the SuperSuit underwater housing. Make sure to order the correct filter mount for your camera. 2. Anti Fog Inserts: These are cheap, effective, and reusable. Because of the temperature difference between air and water, lens fog is very common when shooting underwater. We use CamKix inserts and they come in a 20-pack for around seven bucks (just a few cents each). They are vacuum packed, so they are ready to use out of the package. 3. GoPro Dome Port: There are a few options for shooting half underwater photos. The one we have is by Telesin – this one is by Vicdozia / Telesin. It costs about fifty bucks and comes with everything you'll need. Here's more about how to shoot half underwater photos. 4. Floating Hand Grip: This is a great accessory for body boarding, snorkeling, or boating. There are lots available – the important things to watch for is a good wrist strap, solid mount and that it actually floats. This one by AmazonBasics comes very well reviewed at under twenty dollars. You can direct mount the camera to the grip, it's yellow so it stands out, and it has a decent rubber grip. 5. Underwater GoPro LED Light: I don't have one of these yet, but it's on my list. 500 lumen light with 36 LEDs. This model stacks a GoPro on top and the floater grip or selfie stick on the bottom. It's waterproof to 147ft (45m) and comes with a rechargeable battery. Works great in conjunction with a camera rig. 6. Camera Rig: There are a number of ways to mount your camera to a stable rig. This one is solid aluminum and has two cold shoe mounts. Most rig's allow a couple of cameras and a couple of lights. They make it easier to get stable shots – and front/back point of view at the same time. Here's a DIY GoPro Rig. 7. Selfie Stick: In addition to the anti-fog inserts, this is my favorite underwater accessory. I love how I can get closer to the wildlife! And it makes my shots more steady. I still have my first selfie stick – it is by XShot. It is super compact (6.5″ when not extended), has a tripod adapter in handle, so it can attached to a tripod. It closes to just 6.5 inches and extends to 30.58 inches in length. Hero6 Black / Hero5 Black: Waterproof to 33ft (10m) without additional housing. Hero4 Session: Can go 10m (33′) deep underwater without any housing. To ensure that it is waterproof, check that the side door is both closed and locked. After exposure to mud, dust, or salt water, the camera should be rinsed with fresh water (keeping the side door closed, of course). For best water drainage, set the camera upright (with the shutter button on top). All the Older Models (HD Hero Original, HD Hero2, Hero3): These older models all came with a great waterproof housing, capable of depths of 60m (197′). What's your best underwater tip or favorite gear? Please join us in the comments below! You bet – here it is – and how to use it.